Karsé Kongtrül (Tib. ཀར་སྲས་ཀོང་སྤྲུལ, Wyl. kar sras kong sprul) (1904–1952), who was also known as Jamgön Palden Khyentse Özer (Tib. དཔལ་ལྡན་མཁྱེན་བརྩེའི་འོད་ཟེར་, Wyl. dpal ldan mkhyen brtse'i 'od zer), was the immediate reincarnation of the First Jamgön Kongtrul. 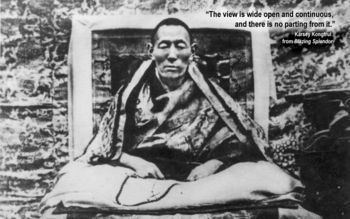 He was reborn as the son of the 15th Karmapa, Khakhyap Dorje, who identified and enthroned him at age twelve in 1902. Karsé Kongtrül resided at Tsadra Rinchen Drak, the seat of his predecessor in eastern Tibet. He received the full education and lineage transmission from the Karmapa. Among his other teachers were Surmang Trungpa Chökyi Nyinche, the 10th Trungpa tulku. He attained realization of the ultimate lineage, was one of the most renowned Mahamudra masters and transmitted the innermost teachings to the Sixteenth Karmapa, Rangjung Rigpé Dorje. On many occasions, he gave teachings, empowerments, and reading transmissions from the old and new traditions, such as the Treasury of Precious Termas (Rinchen Terdzö), and he rebuilt the retreat center of Tsadra Rinchen Drak, his residence above Palpung Monastery. Karsé Kongtrül died on 10 May, 1952 at the age of 49.